Nestling beneath the grass-covered slopes of West Hill and St. Gregory`s Hill the tiny village of Kirknewton leads a quiet life. The fine Church of St. Gregory the Great dominates the cluster of buildings hugging the narrow country road which winds along the northern boundary of the Northumberland National Park between the hamlet of Akeld and the Scottish border at Yetholm Mains. 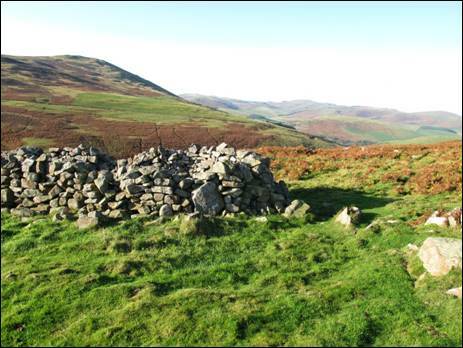 The twin-topped Yeavering Bell rises impressively to the south-east of Kirknewton and offers superb all round views of the surrounding countryside as well as being home to one of Northumberland`s finest Iron Age hillforts. On this short but exhilarating walk from Kirknewton you will contour the lower slopes of West Hill before joining the route of St. Cuthbert`s Way for a short while. Once you are within shouting distance of Yeavering Bell you will climb the steep south-western side of this conical-shaped hill and then, with the wind in your hair, you will explore the extensive ramparts of the Iron Age hillfort. When you have finally descended to Old Yeavering you will make your way back to Kirknewton via the remains of the Iron Age hillfort which adorn the summit of West Hill. It is a walk which will inspire you to delve deeper into the fascinating history of Northumberland. 1. After leaving the A697 at Akeld, the narrow B6351passes beneath the dark imposing slopes of Yeavering Bell before reaching Kirknewton and making two 90 degree turns in rapid succession. Once around the second turn make sure to keep your eyes wide open for the side road on your left immediately before the Church of St. Gregory the Great and next to the large 2001-opened Village Hall. Take this road and you will see, again on your left, a small gravel car parking area in front of the Cheviot View Outdoor Activity Centre (Girl Guide Centre) (GR NT914302). This is your starting point. The church, of which you now have a fine view, houses a 12th century carving of the Adoration of the Magi and is the burial place of the renowned 19th century campaigner for women`s rights, Josephine Butler as well as Alexander Davison, businessman and a close friend of Admiral Lord Nelson. The churchyard also contains memorials to twelve British, Canadian and New Zealand airmen who were killed in the Cheviot Hills during the 1939-1945 World War. 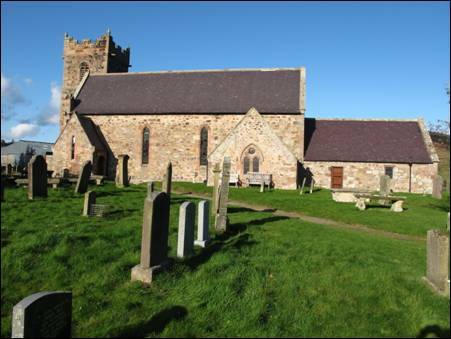 The church and its surroundings are well worth visiting once you have completed this walk. Appetite whetted and sandwiches packed, it is now time to let your itching feet do the talking. So, with your back to the Village Hall and the church on your right head along the narrow tarmac road past tree-shrouded Kirknewton House and then West Kirknewton Farm. Ignore the facing five bar gate and continue with the road which, before you have time to sing a verse of `The Happy Wanderer`, metamorphoses into a grass track. 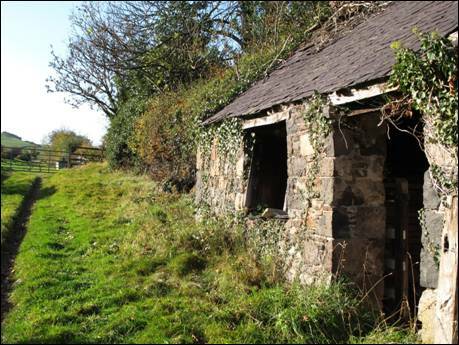 Keep heading forwards, passing on your right, a small and rather dilapidated stone building. This is the Old Forge which was formerly used by the Kirknewton blacksmith. Continue on through the metal gate. 2. The two deep, stone-strewn indentations in the predominantly green track are easy to follow as the lower slopes of West Hill climb gently to your left. Soon you will pass the ruined cottage of Langback, last occupied in the 1950`s, and as you continue forwards the occasional `Hillforts Trail` marker post will keep you on the straight and narrow. The College Burn lies away to your right where the scree and gorse-flecked slopes of The Bell draw the eye towards the shapely and more distant Great Hetha and beyond to the conifer-covered Sinkside Hill. Both of these fine hills are topped with the remnants of Iron Age hillforts and are worth an exploration on another day. Eventually, you will reach a marker post and a shin-high directional sign marked, `Permissive Path` (GR NT909290) where you will spot a ladder stile adjacent to a metal gate downhill to your right. This is your line of travel and as you walk the short distance to the stile you will see straight ahead of you the craggy and impressive Easter and Wester Tors. Once over the stile, turn to your left and make your way to the next ladder stile a very short distance away. When you have firmly planted your boots on the other side, turn half-right and begin your climb uphill following, as best you can, a faint trace. If this by chance disappears altogether, the trick is to aim slightly left of Easter Tor and, as the slope begins to ease, you will spy ahead of you a small gate in the wall (GR NT912288). Head straight through and a few strides further on you will join the track of St. Cuthbert`s Way which, to your right in the direction of the nearby plantation, heads towards a distant Melrose and, to your left beyond the buildings of Torleehouse, towards an equally distant Lindisfarne. You are heading to the left. The way ahead is clearly marked as you skirt past Torleehouse, continuing on an almost arrow-like trajectory to the next marker post (GR NT916291) which carries the `Celtic Cross` symbol of this 62½ mile long footpath. 3. Now turn right and follow the track which, after a very short flat section, bends to the left and begins to climb diagonally across the side of the hill. As you gain some height the gradient becomes slightly steeper before you eventually reach, perhaps with a little relief, a vertigo-inducing ladder stile. This is a good place to catch your breath whilst you enjoy the pleasant view. Cross over the stile and keep with the delightful turf-carpeted track as it continues on a generally uphill course with the conical-shaped Yeavering Bell over to your left. In time, you will reach a four-fingered, shin-high directional sign on the left hand side of the track which indicates to your right, `Easter Tor ¾ Wester Tor 2` and to your left, `Yeavering Bell ½ Gleadscleugh 2`. You must now leave St. Cuthbert`s Way by turning left and following the intermittently waymarked path initially over reasonably level terrain and then downhill to cross the tiny trickle of an unnamed burn. Once you have clambered away from burn the thin path will take you by the hand and lead you up the south-western slope of Yeavering Bell. The occasional marker post, bearing both the `Hillforts Trail` and `Public Footpath` symbols, will prevent you from straying off course. You may wish to take a moment out from your uphill efforts when you reach a slightly down-at-heel circular sheep stell so that you can admire the broadening panorama, with Easter Tor especially prominent. 4. When you are finished with the view, continue upwards and the path will guide you relatively easily to the saddle between to the twin tops of Yeavering Bell. Once there, turn to your right and make your way to the true, cairn-crowned summit of this the most regal of Cheviot hills. 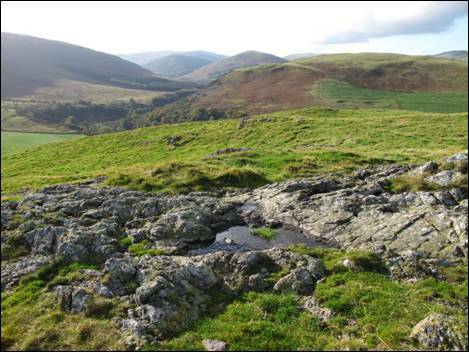 Standing at a height of 361 metre (1184 feet) on the extreme northern edge of the Cheviot Hills, Yeavering Bell enjoys an unrivalled position. In his 1989 book, `The Northumbrian Uplands`, Geoffrey N. Wright described it as, “one of the most rewarding Northumbrian hills for views” as well as having on its summit, “the most impressive and extensive Iron Age settlement in the area”. In his 1953-published book, `Companion into Northumberland`, Sydney Moorhouse agreed and said, presumably after he had visited the top of the hill, “A thousand feet below is the silver gleam of the Glen, and, upstream, one sees its birth at the junction of the mountain-nourished streams of the College and Bowmont Waters”. There is much more besides, including the distant North Sea, Milfield Plain, White Law, Humbleton Hill, Longknowe Hill and the mighty Cheviot. Before you head back across the saddle to the lower of the two tops by a mere 6 metres spend some time to try and identify some of the many other rolling hills you can see in the distance. These days the hillfort consists of a tumbled stone rampart, originally thought to be up to 2.5 metres high, which encloses an area of 5.6 hectares, within which you can still see the platforms of about 130 timber-built roundhouses. It is impossible as you stand here, probably all alone, not to feel the shiver of history run up and down your spine. Here time and space collide. When it is time to leave the summit, and assuming that you are on the subsidiary top, return to the saddle, turn left and head towards a small gap in the stone ramparts. Here you will find a marker post and, turning away to your left, a thin, hill-descending path. This is your downwards route. 5. This is not the most pleasant of descents as you initially cut diagonally across the north facing, stone-scattered slope of the hill. More likely than not, you will be picking your way carefully downhill shrouded in deep and body-chilling shadow with a stiff breeze bringing tears to your eyes. So watch your footing as you make your way towards Old Yeavering guided by the occasional marker post. Eventually, after you have turned more or less north, you will arrive at the dilapidated building known locally as King Edwin`s Palace” (GR NT924301). At the time of writing this walk there were unconfirmed plans to demolish part of this building on safety grounds so, by the time you come to walk this route, changes may have taken place. No matter, you will see ahead of you the two mid-19th century cottages of Old Yeavering and, closer at hand, a small stile next to the building. Cross over and turn left along a track which rises across the lower slopes of St. Gregory`s Hill. This hill, like so many in the area, is topped with the remnants of an Iron Age hillfort although from this point of your walk there is nothing for you to see. Continue along the almost straight track passing, on your right, a large boulder behind which there is a tree with its trunk growing at an angle of 45 degrees from the vertical and then, on your left, you will spot the track you followed upwards earlier in the day. You are now back on the route of St. Cuthbert`s Way and, as you continue forwards, you will be retracing your steps a distance of just over one kilkometre passing first Torleehouse and then, just prior to the small plantation, turning off St. Cuthbert`s Way through the small gate on your right. Once through, take a moment to enjoy the view ahead. In the middle distance you will see West Hill to your right and The Bell to your left whilst in between, in the far distance Kilham Hill and Longknowe Hill roll across the skyline. 6. Now descend half-left towards the ladder stile at the bottom of the hill (GR NT910290) and, once on the other side, make your way to the second ladder stile, slightly to your right and adjacent to a metal gate. Cross over and climb the short slope to the marker post and the shin-high directional sign passed on your outward route. You are now standing on the grass, bracken and gorse-covered southern slope of West Hill. Turn right and follow the green track towards, but not quite as far as, the metal gate. Above you on your left you will see three boulders of varying sizes and if you have some energy in reserve it is worth making a short detour upwards. The view is outstanding and the boulders themselves are extremely photogenic. Back on the track and 50 metres short of the metal gate bear left uphill aiming for the corner post in the boundary fence on your right. When reached, turn half-left and make a more or less bee-line ascent to the cairn-capped summit of West Hill. 7. 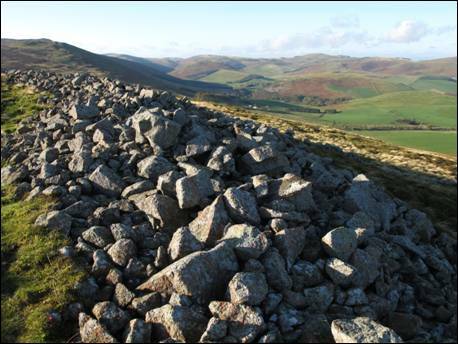 The main defences of the Iron Age hillfort consist of a large tumble of turf-covered stones running along the edge of the slope which, in places, has a stone facing. Traces of a number of hut circles can also be seen and these are believed to be from the Roman period (AD43-410). Whilst you are exploring this ancient monument be sure to look out for one from a more recent time which stands on Lanton Hill. By looking north north east across the River Glen you will see the impressive obelisk erected in memory of Alexander Davison who as well as being a businessman was also a friend of Admiral Lord Nelson. The remainder of the view is of a high quality and needs to be savoured. Once you are done, leave the summit by heading towards the east which, if your compass is tightly packed away, is slightly left of the obvious Yeavering Bell. On reaching a fence watch out for the tiny stile to your right which will lift you across the fence and, boots safely on the opposite side, head straight on following the `Hillforts Trail` marker posts. On reaching a multi-arrowed marker post be sure to turn left and eventually, after following a downhill track, you will reach the base of the hill and a small stile (GR NT911299). Cross over the stile, turn right and simply retrace your earlier steps back to Kirknewton, passing once again the sad and sorry remains of the Old Forge. As you stand beside your car reflecting on the day it is worth comparing your impressions of the area with those of William Weaver Tomlinson. In his 1888-published book, `Comprehensive Guide to Northumberland` he said that Kirknewton was, “a quiet and pretty pastoral village, resting amid a few trees at the base of cone-shaped hills”, adding that he thought that, “the scenery around is very wild and stern”. Perhaps, with 21st century eyes, you will have a slightly different view. Kirknewton (Girl Guide Centre) (NT914302), (NT909290), (NT912288), (NT916291), (NT924301), (NT910290) & (NT911299). Generally good paths & tracks which are easy to follow. Some ascents & descents although in the main they are not too steep.